We’ve all had the joy of hearing about how disgusting our keyboards tend to become. I actually saw proof of this the other day when I thoroughly cleaned mine. Afterwards I wished I’d had something like this keyboard. It’s actually meant for medical and hospital environments where germs and spread of infections are a major concern. However, after seeing what was underneath the keys in my keyboard, I think I might want one of these. The entire keyboard is sealed, which eliminates the space for dirt and germs to hang out in. It also makes it so that you could easily wipe it clean when you’ve managed to spill your drink of choice. 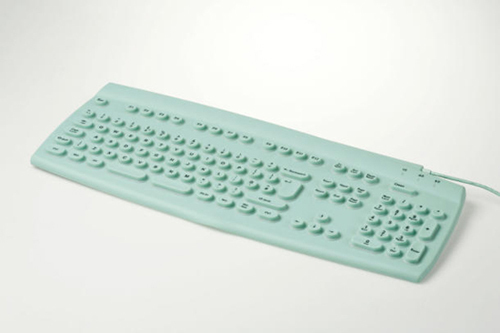 If wiping it clean doesn’t satisfy your clean freak tendencies, then this keyboard is even able to be submerged. If you’re too busy to shut off that PC of yours, you can hit the clean button and clean it while it’s still plugged into the PC. Of course there is no word on how much these will cost you. You’ll have to actually contact Devlin Keyboards to find out that information.